Part 2 we are what..
You can take refuge here and now. 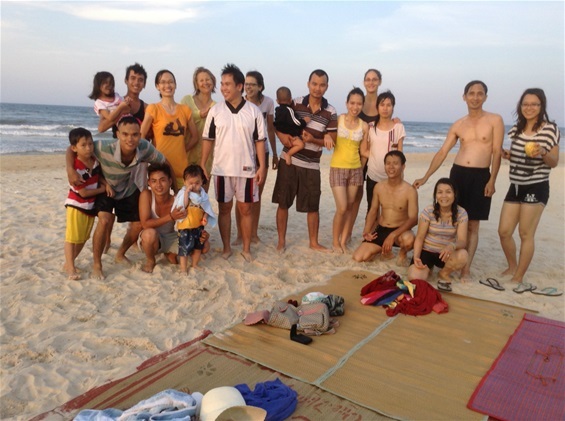 After Hue I had a great time in Hoi An, a charming beach resort. Marie Fleur a young volunteer of TTG joined me and we both enjoyed being « tourists » for 2 days, in the lovely tourist destination Vietnam. In Saigon I joined the Interbeing Sangha for a mindfulness day at Chua Phap Van where Thay founded the youth for social service during the VN war. I was moved to meet many of the pioneer members of this community there. Doing walking meditation there early morning, I had to think of Thay when he was young and practicing here. Did he know what destiny awaited him ? Did he know, did he feel that he would become a world citizen and that his life would become a service far beyond Vietnam ? There were some young members too at the mindfulness day, who joined the Interbeing Sangha only a few days ago in Thailand. 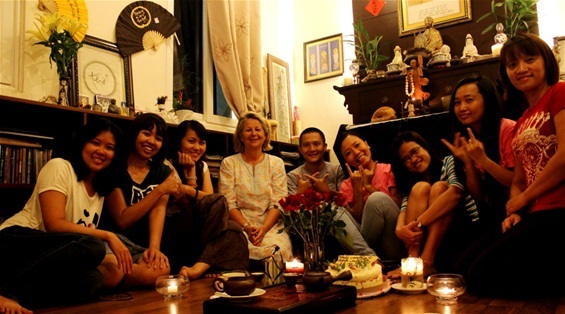 I enjoyed meeting them (most are my FB friends anyway) and in the evening we had a lovely birthday party in one of the young members house. Yes I was waiting for this generation to emerge in Vietnam...for so long ! Young people do WAKE UP ! You look like your dad more than your Italian mum! By the way, I once used to sit on that concrete bench where you were sitting at Wat Pho! Wow, Lisi I couldn't believe that you enjoyed bkk from simple life in Bhutan! Abhisiree, my dear sister,missing you, Naomi I met you when you were just a baby! I am enjoying browsing your photos and your journal! Lots of Love from Byron Bay.